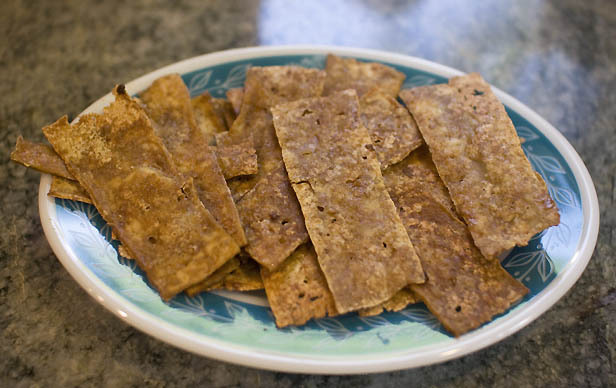 I value simplicity, which is why I love the fact that I can create pound of “bacon” out of a block of tofu, some tamari, a little liquid smoke, and nutritional yeast! 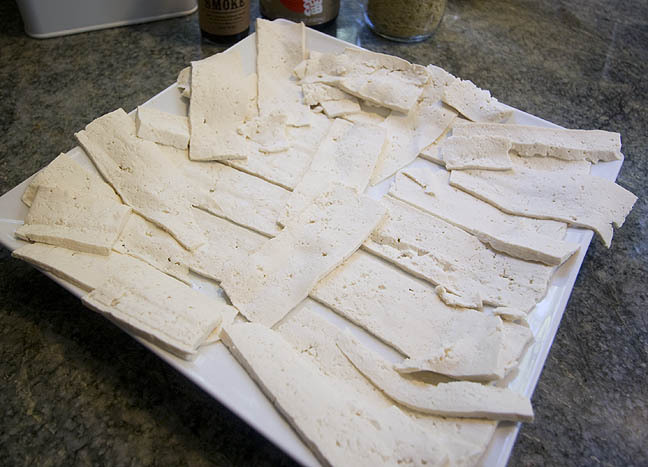 Cutting the strips is the trickiest part, but it’s not that hard if you’ve got a really sharp non-serrated knife. Coat a griddle with canola (or whatever) oil. I can set specific temperatures on my griddle, so I heat it to 350 degrees. 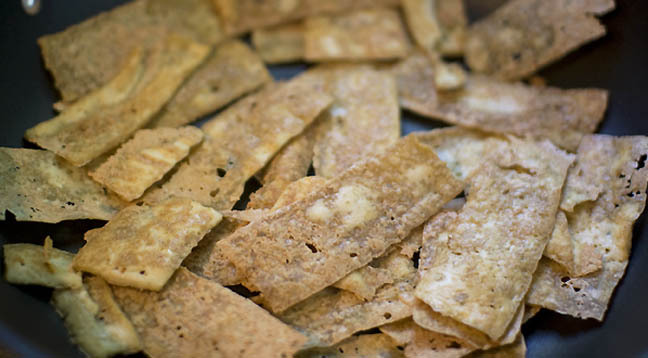 If you’re using a regular griddle or a frying pan, medium-high heat will work. 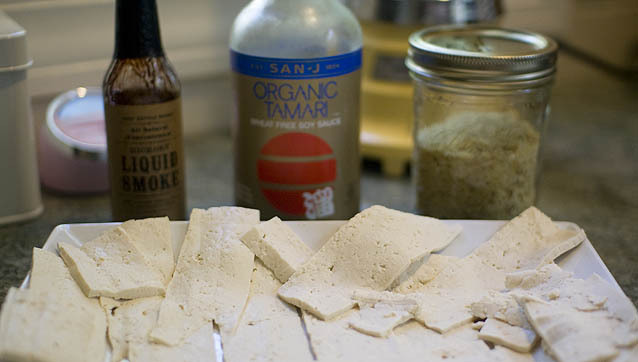 While you’re waiting for the tofu to cook, mix together the tamari and liquid smoke. 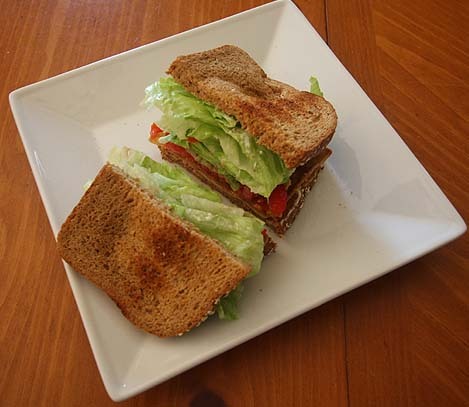 My favorite way to serve this is on BLTs, one of the sandwiches I missed most when I went vegetarian. Not only is this good tofu bacon, it’s good bacon. I swear, it’s a ringer for the real deal, but with much less saturated fat. Sounds good. Im from Vancouver where veggies are common. Have been living north of Copenhagen for a year now. Its been hard finding veggie food in my area, or Denmark as a whole! If you can give me any hints on where you found the Tamari and liquid smoke that would be helpful. I’m sorry to tell you that I bring the tamari and liquid smoke back with me from the US, or have people bring it to me when they visit. I just brought a bottle of liquid smoke to a veggie Danish colleague and she’d never heard of such a thing. I think the only place you might find it here is in an American shop, there must be one in Copenhagen. Maybe they can order it for you? Tamari, I have no idea. The Asian shop here doesn’t have it and they don’t have a clue what I’m asking for. I’m in Jutland, which is not the most veg-friendly region Last year when the volcano wreked havoc on flights, there was no tofu for over a month!